Times of crisis, such as the financial and economic crisis and, more recently, the migration crisis, open windows of opportunity for agenda setting and policy change. However, the added value of policy analysis and utilization‐focused evaluation is often more contested during crises: do crises provide opportunities for the utilization of expert knowledge and policy learning in order to punctuate policy deadlocks and to induce policy innovation or do crises rather inhibit opportunities for the utilization of expert knowledge and policy learning because of political contestation and establishment of a clear political primacy? Building on empirical data drawn from the Dutch comprehensive spending reviews (2010), advisory reports and policy studies, respectively, in the field of the Dutch migration and integration policy (2000–2015), we found that the utilization of expert knowledge is not much different in bad times than in good times. Rather, the type of expert knowledge as well as the way of utilization of expert knowledge is subject to change as boundary organizations are playing a key role as producers of expert knowledge in legitimating policy actors and structures and substantiating policy decisions. 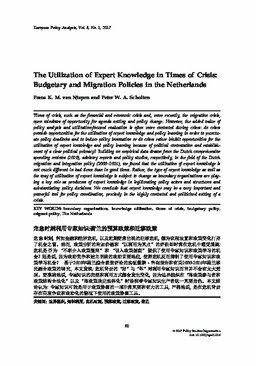 We conclude that expert knowledge may be a very important and powerful tool for policy coordination, precisely in the highly contested and politicized setting of a crisis.